Composites are reaching a new level of celebrity in the materials world. As research advances, engineers and material scientists are finding benefits for lightweighting applications and customizable designs. Such characteristics make composites a good candidate for design refinement and optimization, and serve as a one reason why Bertram Stier, research engineer of advanced composites at Collier Research, chose them as the basis for several new bike designs. 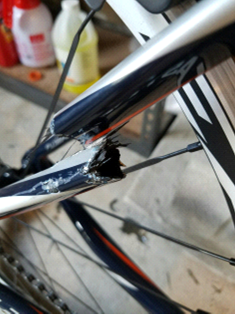 The company also decided that this bike frame application would be a good “gold standard” for developing a program that would help engineers use composites in everyday products, not just industrial designs. Because there’s a massive variety of materials and material allowables, working with composites can create one (or several) mechanical engineering problems, Stier says. To add to the list of conflicting requirements, there are restrictions posed by various manufacturing methods as well as strength and stiffness requirements within the design. And, there is added variety in design that can change from designer to designer—adding a personal touch. Yet, the benefits of composites outweigh the challenges, Stier says. choosing to work with composites can help ensure the structural integrity of the design. Materials can meet the exacting demands for strength and stiffness that high-performance designs require. “You can increase the structural performance by swapping out the material because you can specifically tailor the materials at different locations by defining or optimizing the ply shapes and best direction [and type] of fiber. You have much more freedom,” he says. This freedom for characteristics change can lead to less material usage and lower density of materials, ultimately saving weight and increasing durability throughout the design—a far reach from traditional frames that generally just vary in width of tubes and type of metal. When working with optimization software, Stier turned to a program familiar to him: HyperSizer. Collier Research’s flagship software is available in Pro and Express versions. The software was originally developed for analysis at NASA, making it a high-level optimization and analysis program for aerospace and spacecraft applications. Although they run the same code, Stier chose to work with HyperSizer Express because it simplifies the optimization process and provides the essential tools for optimization—making it more digestible for non-aerospace composite applications. “The entire concept of how you model things is different. You have a much wider design space that is less restricted [than aerospace design], which makes the optimization itself more challenging,” he says. “In HyperSizer Express, we have a very streamlined workflow to [combine requirements] for you,” Stier says. The workflow starts by importing a finite element model and going step by step through the optimization problem. This not only helps save quite a bit of time, according to Stier, but also allows users to easily add or remove optimization constraints and requirements as needed throughout the design process. 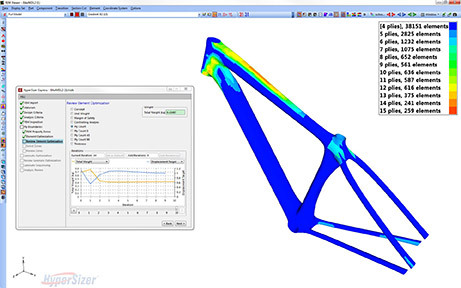 When working with his bike designs, Stier says that the most useful features within HyperSizer include the large variety of strength criteria already embedded within the software, as well as the static stiffness constraint. By having capabilities already built into the software, he says that the users don’t need to spend time individually defining the criteria because it’s readily available and integrates itself into a guided optimization process. Going forward, Stier says tools for transient/highly dynamic loads would be most beneficial to develop to help predict mechanical waves propagating through a bike structure. He says that there are current concepts with equivalent static loads to help serve as somewhat of a basis for optimization, but it’s still in the early development stages. “The accuracy of these types of analysis and performance of optimization products that are out there is not as great as it is for static loads,” he says. So where should the industry focus to bring optimization software to the forefront of the design process? Stier says there are three main areas: education, time and software. In addition to the hurdle of specialized knowledge, time constraints also come into play. With increasing product complexity, many engineers aren’t going to want to sit down and do extensive math to figure out an optimized design; their job is to create and manufacture things. Still, people who want to do optimization at least do a basic analysis of their product with simulation, Stier says. Additionally, software for optimization to date has been incredibly complicated for engineers to use. “A lot of optimization software speaks more the language of mathematicians, even though it is a software made for engineers,” Stier says. This is what HyperSizer Express achieves by having simulation analyses serve as the basis for these optimization models. The user answers questions that make sense for an engineer to ask throughout the design process.